In some ways he looks like a progressive—but he was also an extreme individualist. 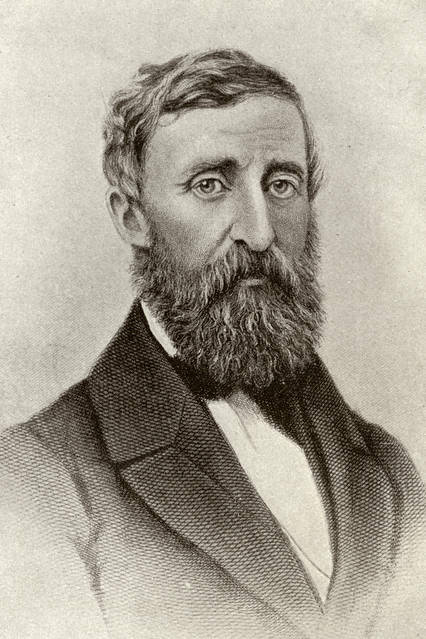 Here’s something to ponder about Henry David Thoreau, whose bicentennial birthday is July 12: Was the writer on the political right or the political left? Thoreau certainly has some progressive credentials. A principled and active abolitionist, he participated in the Underground Railroad and defended John Brown’s raid on Harpers Ferry. He spent a night in jail for refusing to pay taxes to support the Mexican-American War, which he regarded as an imperialist adventure and an attempt to extend slavery. His work, in revival half a century ago, helped inspire the modern environmental movement. He criticized many of the signs of industrial capitalism as it emerged in the 19th century, and he reviled the sort of people who were making it happen. Yet Thoreau was an extreme individualist. Had he lived to see the emergence of Marxist communism and other radical labor movements in the U.S., he would have skewered and dissected leftist collectivism of any and all varieties. He respected dissenters, even those he disagreed with. People in consensus—or, he might say, those incapable of producing independent thought—seemed to him slavish and not fully formed as persons. Above all, he was a consistent skeptic of and opponent of state power, the force which the left believes can cure the world. “The merely political aspect of the land is never very cheering; men are degraded when considered as the members of a political organization,” Thoreau wrote in “Natural History of Massachusetts.” And in “Civil Disobedience,” his classic essay: “Government never of itself furthered any enterprise, but by the alacrity with which it got out of its way.” He asserted that he would hate to think he was dependent on government and one of the goals of his experiment in domestic economy at Walden Pond was to prove he wasn’t. Someone who would “quietly declare war with the State” probably wouldn’t be in the streets defending ObamaCare. Thoreau argued in “Civil Disobedience” that a man must not “for a moment, or in the least degree, resign his conscience to the legislator.” In his “Plea for Captain John Brown,” he added: “It is of no consequence whether a man breaks the law or not.” These positions would be anathema to the state-worshipping left and the law-and-order right. Thoreau can’t be explained by the modern understanding of left and right; annexing him to either side is the worst sort of anachronism. The influx of European immigrants and ideas to the U.S. in the late 19th century permanently changed politics by introducing the modern left-right spectrum, deriving in part from Karl Marx’s writings. So beware contemporary thinkers who try to claim Thoreau as their own. Not that there is anything contradictory about the thinker’s views. It is precisely their consistency that puts them at odds with today’s political divisions. The modern political spectrum, embroiled in tension and contradiction, simply cannot account for many legitimate political philosophies like Thoreau’s. While the 19th-century feminist and peace movements, like radical abolitionism, were driven by individualism, today’s progressives appear more committed to collective identities than to any particular position. The movement is driven by an urge to merge, to become one consciousness with members of the same class, race or gender. Right-wing nationalism displays the same collective impulse. Thoreau insisted that collective identities ignore the reality of individual difference and can be simulated only by massive coercion. And since Thoreau’s era, attempts to forge collective identities or combine many people into a single mind—think Mao’s Cultural Revolution—have killed millions of actual human individuals. Ever since the polarization of left and right in the late 19th century, the world has suffered from a series of dangerous isms: murderous communism and bloody fascism, nationalism and internationalism, rapacious capitalism and compulsory collectivism. Turn on your television and you’ll see the world suffering from an extremely confused polarization. On Thoreau’s 200th birthday, maybe it’s time to think about political possibilities afresh. Mr. Sartwell teaches at Dickinson College in Carlisle, Pa. His most recent book is “Entanglements: A System of Philosophy” (SUNY Press, 2017). Peter Theil: " The Diversity Myth"